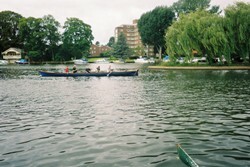 Join Adventure Cafe for a one day Adventure Challenge with a twist - afloat on the river Thames. The Thames is one of the iconic sights of London, blending the history and architecture of West London with scenic natural beauty of the pleasant countryside along the green corridor that the Thames provides. Join us on the Thames as it snakes its way past some of the cities most famous sights. We shall spend time on both semi tidal, and non tidal stretches of the river. 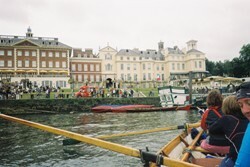 This is a one day challenge, rowing a traditional rowing skiff down a very scenic section of the Thames from Richmond to Hampton Court and back again. The challenge is approx. 21kms. From Richmond you will pass by Twickenham and then on to Hampton Court Park where you will stop for lunch. After lunch you head back onto the river for the row back to Richmond. There will also be a lock to navigate on the route as we make the transition from Tidal to Non-Tidal river! On arrival back to Richmond you will be debriefed and then have the opportunity to head to the pub for drinks and challenge banter. The challenge will be physically tiring so a good degree of fitness and upper body strength is required and it is not for the faint hearted. Please Note: This is a bespoke challenge for private groups. The guide price is based on a minimum of six people in one boat. Discounts may be available for larger groups. All timings are approximate and may be changed to suit group. 09.00 Arrival at Richmond and challenge briefing. 12:00 Stop for lunch at Hampton Court. 12.30 Back on the water for the return leg. 15:00 - 16:00 Arrival back at Richmond for debriefing. Congratulations! What is a Level 2.0 Paddle Challenge Like? How Fit Do I need to be to join a Level 2.0 ‘Paddle Challenge’? This itinerary can also be extended to a huge 50km length version across one very long day for £129pp. Please contact Adventure Cafe for more details. Safe place to store Car Keys for the day! By nature all activities contain an element of risk.Your leader will be first aid qualified and will carry the appropriate safety kit for the activity, such as mountain safety shelters, first aid kits, walking rope and from time to time mobile radios. Safety equipment carried will be appropriate to trip. The leader's primary role is to ensure your safety, but it is your responsibility to listen to their guidance and instructions.